Jeff Fujimoto, Molly O’Rourke, Ann Shiraishi and honorary EBJI member Mike Eldred all competed at the 2011 Senior National Championships held on April 29-30, 2011 in Orlando, Florida. With hundreds of competitors vying for a National Title, the Senior Nationals always attracts the top ranked players in the country. Mike Eldred, the number two ranked player in the country in the men’s 73kg division, led the way for EBJI and Western Idaho Judo Institute, by taking gold. Mike cruised to the final where he met top ranked competitor Nick Delpopolo. Delpopolo, who is ranked 16th in the World, was the number one seed in the division. In the Gold Medal Match, Mike and Nick went back and forth. Although Delpopolo had several solid attacks, Mike controlled him with tactical gripping and strategy. The match went the whole 8 minutes, including the 3 minute Golden Score (overtime) period. At the completion of the match, there was still no score and it went to a referee’s decision where Mike won 2-1. This win gave Mike the National Title as well as a chance to fight for a spot on the Pan American Games team. Because Delpopolo was the number 1 seed and was defeated in the finals by Mike, this forced the two to engage in a best of 3 fight off for the Pan American Games Team spot. Mike controlled both of the matches in the fight off, similar to how he had in the final. In the first fight off, he won a unanimous referees decision at the end of overtime. In the second match, he threw Delpopolo for a yuko score with sumigaeshi. He held on for the win and a spot on the team. Both he and Delopopolo will be representing the USA a the Paris World Championships in August. Molly O’Rourke also had a stellar day going 2-0 to win the women’s 78+kg category. En route to the finals, Molly easily dominated her opponent by throwing then pinning her for ippon. In the Gold Medal match, Molly competed against an opponent over 100 pounds heavier than her. After being thrown for wazari early in the match, Molly came back and threw her opponent with drop ippon seoinage for ippon. Since she was the number one seed going into the Nationals, Molly was named to the Pan American Games Team. This is her second National Title, with her first in 2005 at 78kg. Jeff Fujimoto won his first Senior National medal in the men’s 60 kg category by taking bronze. Jeff, who began training at EBJI in January, easily beat his first opponent by throwing him for ippon. In the semi-finals, Jeff faced a familiar opponent: number one seed Aaron Kunihiro from Team Force. Jeff and Kunihiro grew up competing against each other in Southern California. The match was nail-bitingly close with Jeff taking the early yuko lead after Kunihiro received 2 stalling penalties. Kunihiro came back aggressively, throwing Jeff for a yuko score in the 2nd minute to tie the match. With about 2 minutes to go, Kunihiro threw Jeff again for wazari, taking the lead. Jeff was able to score another yuko, but was unable to overcome the wazari-yuko to 2 yukos score and lost. In the bronze medal match, Jeff fought number two seed Dan Gomez and threw him for ippon with sode tsuri komi goshi. 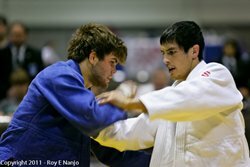 His win moved him up from number 9 to number 3 on the USA Judo Roster and gave him valuable competition experience for the future. Annie Shiraishi was the top seed in the women’s 48 kilogram category. After defeating a familiar opponent in the first round, Annie was in the gold medal match competing against number 3 ranked player Angela Woosley from New York. Angela had surprisingly defeated number two seed Katelyn Boussou in the semi finals, whom Annie had lost to at the 2010 National Championships. Annie had several strong attacks before the match went to the mat in the 2nd minute. Annie attempted a turnover, which was defended by Angela. Angela then proceed to extract her leg from Annie’s hold to pin her for 25 seconds to win the National Title. As a result, the two engaged in a best out of 3 fight off for the Pan Am Games Team, which Annie won 1 match and Angela won 2 by countering Annie’s attacks. Although she had to settle for the silver medal, Annie still retained her number one ranking in the United States and has a very good chance of making the 2011 World Championships Team. Dan Israel Sensei, IJF B Referee, also attended the tournament to represent EBJI and referee. The team was accompanied by David Matsumoto Sensei and Sayaka Matsumoto Sensei as coaches.